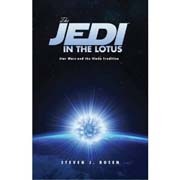 Written by Steven J. Rosen, The Jedi in the Lotus – Star Wars and the Hindu Tradition explores the Hindu symbolism in the Star Wars films. This book is a must read if you are a Star Wars fan and wants to know about the use of the universal wisdom of Hinduism in the series. For a practicing Hindu (with a knowledge of Star War Series), the book provides with information about the parallels between Star Wars and teachings, ideas and situations from Hindu scriptures like the Ramayana, Mahabharata (especially the Bhagavad Gita), Puranas (especially the Srimad Bhagavad Purana) and Upanishads. If you have no idea about the Star Wars series but is still interested to know about the use of Hindu symbols in the films, the author has provided an exhaustive introduction and synopsis of the Star Wars. Similarly, if you are new to Hindu religion, the author provides a simple introduction to the oldest living religion in the world. The book is undoubtedly the result of a painful research of both the Star Wars series and its parallel in Hindu scriptures. There are no vague quotes or broken ideas or parallels that are fused by force for the sake of proving a point. Instead the author provides a detailed analysis of the use of Hindu symbols. A highlight of the book is that Steven J. Rosen never tries to belittle the Star War series. Quite often many authors of similar books try to belittle, or accuse of plagiarism of, a modern series by pointing out that there is nothing original as it is a copy of the stories from an ancient tradition in a modern setting. But Steven J Rosen, details the philosophical depth of the Star Wars series and the hidden universal truth in it which were taught by Hindu Gurus for centuries. Star Wars Series is fantasy, futuristic and is a journey to unknown worlds by the highly advanced 20th century human beings. More than 5000 years ago, Hindu Gurus made such deeper journeys to unknown worlds and narrated about technology and events. The Jedi the Lotus – Star Wars and the Hindu Tradition is a bridge that connects the minds of Hindu Gurus and the creators of Star Wars Series.